Which one of these covers is more damning? 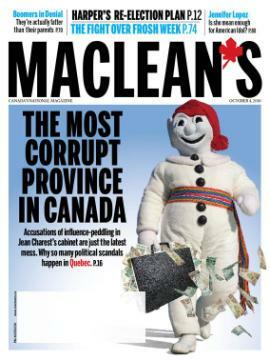 Now that a little time has passed I was reflecting on the controversy about the Maclean’s cover about Quebec as “The Most Corrupt Province in Canada” and remain amazed at the outcry it generated. It is stunning that Parliament took time out to condemn the cover. I don’t say this because I think the article is true. Let’s face it, Canada really isn’t that corrupt. In 2009 Transparency International ranked us as tied for 8th as the least corrupt country in the world. What is more interesting is that so many people felt it was in their interests to take seriously (or exploit) what was obvious link bait. Lots of reasons can account for the difference. 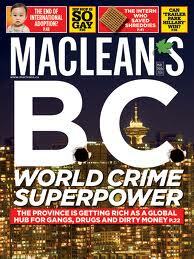 Part of it may be that BCers frankly don’t care what the rest of the country – not to mention Maclean’s – think. It’s also possible the BCers have less of a sense of common identity – especially one sensitive to how the central Canada describes it. It may also be a reflection of how political power doesn’t always flow with demographics or even opportunity. Today there are few seats to be won in Quebec – the bloc is entrenched and unlikely to move. making a big stink probably isn’t going to change one’s fortunes. In contrast, in BC, vast swaths of the province are up for grabs for all the parties (save the Bloc) – defending the honour of BC might actually yield something. And then, of course, all the parties may not be interested in condemning the Superpower of Crime label – a real, or imagined – creates a mega-crime menace in BC that would play well with a party interested in finding kingpins to fill the empty prisons it plans to build. Perhaps not coming to BCs defense is the shrewd move for some (although one is left wondering, where were the others?). I think what is most interesting though is that it suggests that for all of the past challenges Quebec has had regarding being in Canada, it is an activist member of the dominion, both in its politics and in its populace. Quebecers seem to care what the rest of the country thinks and they’ll sharpen their elbows and let themselves be heard if necessary. In short, they’ll play in the game. BC has never cared to separate, but sometimes it feels like the province the least part of the dominion. Federal politics don’t get much play in BC, its provincial politicians rarely play the federal game (well) and its population is usually oblivious to what goes on east of the Rockies. Hence the irony of a province that has at times wanted out still cares so much, and a province that defined the country by asking to come in, cares so little. Or maybe it’s just all a fun note about the fun country we live in and how old stereotypes sometimes send us into a tizzy… and sometimes not. This entry was posted in canadian politics, commentary, media and tagged canada, macleans, politics, quebec on October 22, 2010 by David Eaves. Perhaps we didn’t even know Maclean’s still existed. There’s an interesting blog by a fellow in SK who says he attended a meeting with a provincial cabinet minister, where the minister instructed him to bribe an RM administrator. So far he’s not been sued for libel, again, over the claim, even though other parties mentioned could. I think Sask. may be in the running for that Macleans cover, but the writers didn’t dig very deeply into other places. But there’s also a ton of emotive diff. b/w the terms “corrupt” and “world crime superpower” – the latter sounds like an honorific. Could be that Quebec nationalism is over-represented in parliament due to a broken electoral system. provincial Quebec Liberals (could be wrong about this). The French-Canadians have their feelings hurt easily and BC just doesn’t care what the federal government thinks (but we do know what goes on beyond the rockies). Everybody knows Quebec is the most corrupt province. No other province even comes close. Quebecors seem to be in denial and instead of being outraged should take a long hard look at their have not province. Do any of them keep track of all the scandals and money that goes missing on construction projects?